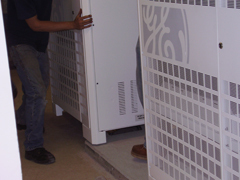 Static Power provides installation services for all power protection and back-up equipment. Whether the equipment was purchased through Static Power, or you purchased the equipment from another source, we will manage the installation, testing and commissioning of the equipment at your facility. We install full systems, single unit back-ups and battery replacements. We believe that supplying the right equipment for a project is critical, but also understand that many problems with power protection systems are the result of a poor installation. Proper installation is an integral part of the overall reliability and successful operation of the unit. Our expert technicians will work with your staff to ensure a seamless integration of the proper UPS based on site requirements, project scope and the product. Our installations meet or exceed IEEE and factory standards.